This is a virtual copy of grand piano Pleyel model F from 1926 (size 1.64m), provided by Christophe Nebout, specialist in restoration of pianos from the early XXth Century. Frédéric Chopin, who preferred to compose and perform on Pleyel pianos, had a close friendship with the piano manufacturer Camille Pleyel (son of the founder Ignaz Pleyel) who was also a piano virtuoso. 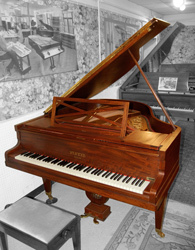 Pleyel pianos were later also used by other major composers such as Debussy, Ravel and Stravinsky, and by the legendary Chopin interpreter Alfred Cortot. Pleyel brought major innovations, such as the metal frame, the popular upright piano and the more exotic Duo-Clave double piano. The Pleyel sound can be described as round, warm and sensual. Chopin said "when I feel in good form and strong enough to find my own individual sound, then I need a Pleyel piano". The Pleyel add-on was created in the frame of the cultural project KIViR (Keyboard Instrument Virtual Restoration) which involves partners such as museums, piano restorers and individuals.